On Wednesday night, I guest-hosted Teachers Teaching Teachers on the topic of technology and storytelling. It was a bit nerve-wracking (not knowing how things were going to go and how to get everyone on) but exciting and informative and all of that good stuff. You can listen to the show as a podcast now and check out the chat room discussion. What IS digital storytelling and is that even the correct term? Are our notions of DS constricted by the genre of personal narrative? How does the interactive Web 2.0 play into what we envision for future storytelling? What is the ABC project all about? What role does privacy of the storyteller (young person) play in the publishing aspect of the work? Thanks again to Paul and Susan for inviting me to sit in. They are wonderful hosts of that weekly show. So this is what I get for suggesting a topic to Paul Allison for the wonderful Teachers Teaching Teachers show — he asks me to guest host this Wednesday night (9 p.m. Eastern time) on the topic of how we can integrate the Web 2.0 technology with storytelling. I am, of course, honored and excited to be asked to sit in the Big Chair and I want to invite you all to join me. The concept of digital storytelling has been around for some time as people began to envision the impact that the visual and aural elements could have on the traditional writing process. 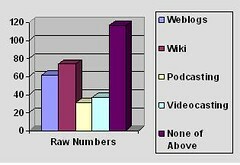 Video documentaries, radio reflections and other experiments have blossomed with the Web 2.0 world. There are many publishing sources and many means of expression. But what does it all mean? How can the interactive web be tapped into to bring storytelling and composition to an even deeper level of meaning for the writer and for the audience? Join guest host Kevin Hodgson, who is the technology liaison of the Western Massachusetts Writing Project, this week on Teachers Teaching Teachers as he seeks to explore some of these questions. Kevin is a sixth grade teacher who has students create digital picture books (last year’s theme — math, and this year’s theme — science) and stop-motion claymation projects (in which his sixth graders collaborate with second graders). He has been exploring the intersection of the world of digital storytelling and the Web 2.0 frontier in recent months with NWP Colleague Bonnie Kaplan through a community Weblog and a new collaborative ABC movie project that features more than a dozen teachers throughout the country who are contributing video segments to a larger collaborative project that uses online tools to plan, produce and distribute a digital story. The program will try to showcase some different aspects of storytelling and technology, brainstorm some ways that people can get started, and consider what the future holds for telling stories in a digital environment. Our guests will include Tonya Witherspoon, who has run a claymation movie camp for kids; Gail Desler, who is part of the ABC Movie Project and a deep thinker on the pedagogy underlying the use of technology in the classroom; and others. Please join us for the conversation this Wednesday evening on EdTechTalk.com (6pm PDT / 9pm EDT / 1am GMT (global times). I hope to hear you then. Jeff Grinvalds, of the Nebraska Writing Project, just published an informative article for the NWP on reducing technology glitches in the classroom (what? I never have glitches, do you? Hmmm) that gives some practical advice for teachers considering technology. Check out Jeff’s article: Technology in the Classroom — How to Reduce the Glitches. Once again, I had the good fortune to be invited to join the Teachers Teaching Teachers skypecast this week and was able to talk up my Making Connections and Youth Radio collaboration projects. I like hearing the voices of my colleagues and friends, and being part of the discussion on a variety of topics and I feel as I learn some new things along the way, too. I want to thank Paul A. and Susan E. for the wonderful job they do in playing host to such a wide range of teachers and topics. PS — Here is an archive of shows that I participated in at TTT. In our big Making Connections project this year (we are in the second year, thanks to funding from the National Writing Project), we asked students to take an online survey before they started to do any blogging. We were looking to gather some data about perceptions of students as writers and users of technology. We have had about 250 students take the survey, which we believe gives us some reliability. Some teachers will be sharing the data with their students and with their administration. How do you use technology to communicate to others? Do you think you write better on paper or on the computer? Do you think schools should teach technology as a ways to communicate with others? Which of these tools have you used in the past year? Open Response: Why should schools teach technology? Open Response: What will a classroom look like in the future? I am project leader for an initiative (funded by the National Writing Project) that seeks to use weblogs to connect students. We have 15 teachers from five school districts, and about 300 students using blogs to write and interact. We just finished the first phase of our project, in which students introduce themselves and comment with each other. We have had almost 1,200 posts on the Manila-based Weblog that we are using (the poor server). This weekend, the teachers all met to talk about how things are going. For the most part, they are not technology-proficient, so this project is pushing them in new, and sometimes frustrating, directions. “Everything is going okay so far. The only problem we have had has been gremlins in the machine that won’t accept the kids’ passwords or even their existence as members when they try to log on. The weird thing is that on any given day some kids get on successfully while others do not. There seems to be no consistency in who the particular victims will be – someone may have no problem one day, but may have to try 2 or 3 times to get logged in the next day.” — Mary M.
“Things are going well, slow but sure. My fifth grade students are enjoying this ‘new’ way of talking, especially the relaxed writing style. It was refreshing to see some of my more reluctant participants jump on the tech train. I am wondering how I can keep this same enthusiaism as we try to find time and space in the computer lab. The chatter is great. Kidos want to get on and talk with each other. I have one student who got onto the site from home. I’m not sure about this…I wonder how I can control what happens outside my perview? I have a new layer of responsibility that I’m not yet sure about.” — Mary F.
“Again, I’m having trouble when I really wasn’t expecting to. I planned to blog with a class that I had a support teacher with and that is usually a pretty enthusiastic bunch, the principal had been notified and seemed to be on board, etc., and Wendy said she would help if I needed her. Then- My support teacher and Wendy were assigned to new Lindamood Bell classes during that block, the principal got MCAS panic, and my class, for the most part,decided they are not that interested!” — Mary D.
So, as you can see, there is a lot of reflection going on with the project, and many hurdles to overcome. 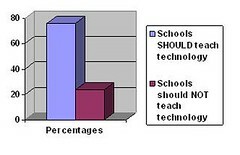 In the next day or two, I will share the data from a survey we had our students take around technology. The introduction to our Making Connections Weblog project (through the National Writing Project) involves an entrance survey, just to gather some data about student perceptions and use of technology. My students took the survey the other day (online, through Survey Monkey) and it is quite interesting to see the results. 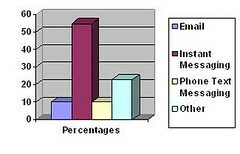 86 percent that schools SHOULD teach how to appropriately use technology to communicate with others. The National Writing Project is featured in the recent edition of T.H.E. Journal magazine as one organization that sees the potential and benefits of technology in the classroom. The article notes that blogging has a strong foothold in the NWP network (we know this ourselves). The article also mentions the Technology Initiative, which my Western Massachusetts Writing Project is part of through our Making Connections project (more on that to come soon as we are almost set to launch our second year). Jim Gray founded the National Writing Project in California in the early 1970s as a way to gather teachers together to share best practices in the teaching of writing and to become writers themselves. He passed away in the past year. (He published a wonderful book called Teachers at the Center about the early days of the writing project). The Voice, a publication of the NWP, recently published some wonderful reflections on Jim Gray’s impact on our network of teachers, and this retrospective included the so-called unwritten Gray’s Laws that seem very insightful. If you become defensive, you lose. When issues are controversial, communication between opposing sides is mostly impossible. The Macbeth Family Factor — It pays to consider the consequences, lest you go mad. The Iago Factor — There really are a lot of mean-spirited people in this world. Anyone who has made up nine laws will add a tenth. You can read some of the stories about Jim Gray through the Bay Area Writing Project site.